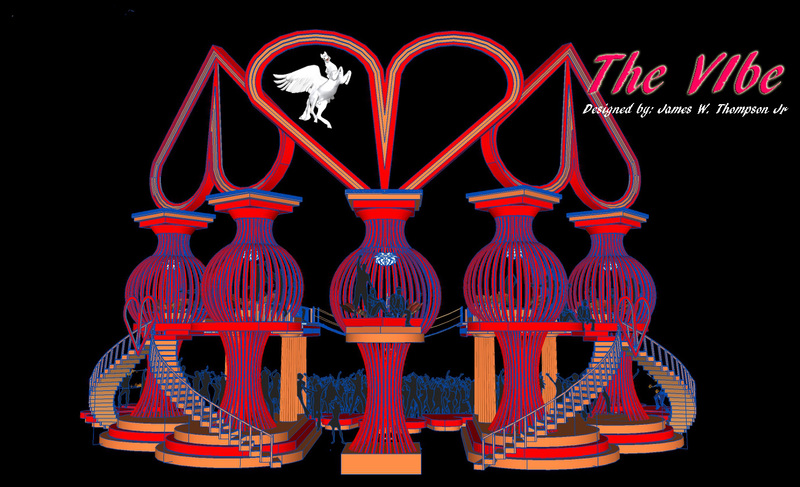 I’d like to introduce you to my conceptual art installation idea that that I’m hoping to bring to Burning Man Aug. 2018.
the purpose of The Vibe is to provide a space that helps elevate the vibrational output of all who visit. This is based on a personal belief that we humans are constantly emitting a vibration. Heck….We are vibration beings, so good at interpreting vibration that we don’t realize were doing it. An easy way to apply this to your life is to recall the creepy guy in the corner…you felt his vibe and you avoid him..yes? How about that person at the party who you had to meet? Didn’t know them… but something compelled you to go say hi. Why? Because you interpreted their infectious vibrational output. Why is your vibrational output important? Because it’s constantly sending a pulse into the universe, like a ripple in a pond, and that pulse is creating your life’s situations. We humans are slowly evolving out of a victim mentality where we blame external sources for our life situations and stepping into the truth where we find that we create our reality through our actions, thoughts and feelings about those thoughts. Quantum physics have suggested that our external world is a reflection of our internal world. So the situations you experience daily are their to server and guide you into a higher life-form. I can speak for hours on this topic, but for right now, this post, is a call for individuals with ideas and concepts about how to make The vibe a transformation experience for everyone who visits. I referred to the 2nd level bubble spaces as positive vision pods. I wrote ” It’s a place you’ll go to sit and contemplate all the amazing possibilities for your life. Love and Light is the theme here. Warm inviting spaces where folks will go to interact and maybe even tune into the frequencies produced by the other hearts surrounding them.” These spaces are inspired by an image I came across of a human producing a magnetic field around the body. According to the info, the magnetic field is produced by the human heart. It suggests that our hearts are constantly communicating with each other’s hearts. So…..I would like to step up the game here and use these spaces and other spaces at The Get Down for all things that help raise the vibration of all who visit. This is where you come in. Do you have ideas on how to increase one’s vibrational output? It could be as mindful as teaching a yoga or guided meditation class on the lower level during the day. Or maybe you have an idea for the design of one of the pods? Maybe you know someone who has an idea that we can collaborate and bring to fruition as a team? Feel free to reach out. I ‘d love to meet others who feel strongly about this process and would like to help me develop the spaces that shift the lives of all who visit.